It’s already mid-February, folks, and you know what that means? It’s time to eat excessive amounts of chocolate again! But for those of you looking to indulge in something a bit more figure-friendly, treat yourself to some cupid-inspired decor ideas. Valentine’s Day gets all the pretty colours, with its sea of pinks and reds and little hearts, so in honour of this short-lived celebration of affection, I present to you a collection of all things stamped with love. Here’s a crafty idea for a love-themed display that doesn’t scream Valentine. Assemble heart-shaped cutouts from an old book (use glue or thread to hold the hearts at the seam) and place it off-centre in a pretty shadow box. 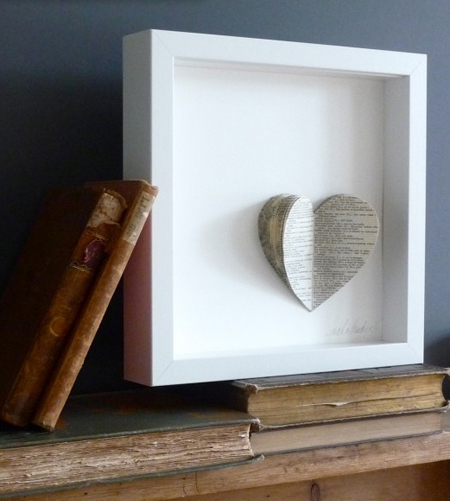 For a romantic look, place the frame on some old leather-bound poetry books. Super simple and not season-specific. Read the full article at Canadian House and Home.